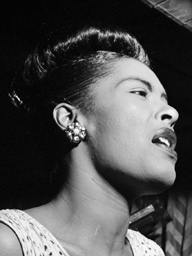 2 Ain't nobody's business if I do (1954-Sep-25?) 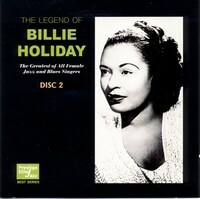 LR - Roulette RE-127 / Vogue VJD510 / LDB.13 / JUTB 3042 2'27"
3 Billie's blues (I love my man) (1944-Apr-08?) AT A4756-3 Commodore XFL15351 / King SLC-453 / LDB.23 2'55"
5 Strange fruit (1945-Feb-12?) LR - Clef EPC298 / VerveJ MV2520 / LDB.02 / JUTB 3035 3'01"
6 All of me (1944-Jun-25?) BC - Totum 1037 / LDB.02 / JUTB 3035 1'44"
7 Do nothing till you hear from me (1944-Jan-18?) LR JDB-100 FDC 1007 / LDB.01 / JUTB 3035 / Navy V-Disc 672 / FS-265 3'24"